The International Space Station's robot arm, operated by Expedition 2 Flight Engineer Susan Helms, moves the Joint Airlock into position. The Quest Joint Airlock is a pressurized flight element consisting of two cylindrical chambers attached end-to-end by a connecting bulkhead and hatch. The airlock is the primary path for International Space Station spacewalk entry and departure for U.S. spacesuits, which are known as Extravehicular Mobility Units, or EMUs. In addition, the Joint Airlock is designed to support the Russian Orlan spacesuit for spacewalks. The Joint Airlock acts as a stowage area for EMU hardware as well as a staging area for crewmembers preparing to conduct a spacewalk. A combination of the depress pump and pressure equalization valves located within the hatches accommodate the depressurization/pressurization capability of the airlock. The addition of the airlock permits Space Station-based spacewalks to be performed without major loss of environmental consumables such as air. The Joint Airlock was attached to the Station on July 15, 2001. 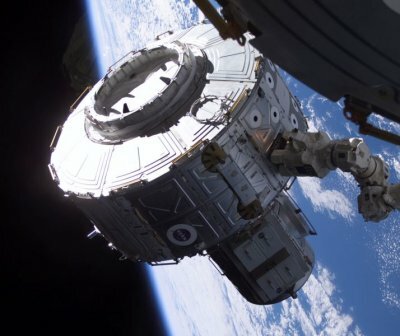 Five days later, Astronauts Carl Walz and Daniel Bursch were the first to perform a spacewalk through the new airlock. The first spacewalk to be conducted from Quest without a Space Shuttle present was on February 20, 2002.